U.S./Afghan Junior Investor Program a HUGE success! success. Through the ten-part curriculum covering everything from education, economics, family life, sports/recreation, belief systems, communication, food, art, government, geography and more, the Minnesota 12-year olds have now gained a greater understanding of life in Afghanistan. They are also able to articulate how the high illiteracy rate there links to poverty, how poverty links to vulnerability, how vulnerability links to the instability of a nation…and how unstable nations are prime targets for terrorist groups to infiltrate. As a student-led solution, the kids organized their own individual and group fundraisers including bake sales, yard work, babysitting, holding carnivals and more. 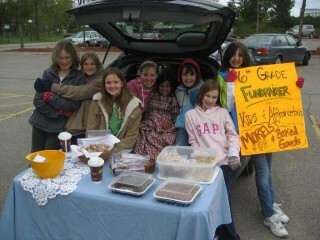 Afterwards they donated the proceeds to purchase much-needed school supplies for their Afghan friends. “They understand how supporting education can help lead to peace,” says Dina Fesler. Viral Video Challenge..extended one EXTRA week! Great news! WKR donor John Stettler has decided to extend the viral video 10,000 view for $10,000 challenge to May 31. Please use this opportunity to help us continue to get the word out and reach the goal. If we can raise $10,000 we can continue to help displaced Afghans get back on their feet and avoid joining insurgent groups to support their families. Last day to support the $10,000 challenge! Today is the last day to help support “Briquettes Into Bridges,” our program bringing job opprtunities to help displaced Afghans get jobs…simply by watching VIDEOS! If you haven’t done so yet, please watch the four short video reports at www.warkidsrelief.org/bridges/follow TODAY and $4 will be donated on your behalf. If you have watched them already, please help us spread the word by forwarding the link on. Hopefully we will raise enough funds to bring a lot more opportunity to these vulnerable Afghans vey soon. Briquettes Into Bridges: the 10,000 video-view challenge! A lot has happened in a unbelievably short period of time since we began our work in Afghanistan. Only six months ago we launched the Helmand Children’s Medical Fund (HCMF) which helped 386 desperately ill children in the Charahee Qambar IDP camp get urgently needed medical treatment. And only three months ago we began “Briquettes Into Bridges”…the vocational training project that is now creating employment opportunities for the adults in the camp, as well as a literacy program. We have battled many challenges to get this latest project off the ground, including the Taliban trying to take our trainees away, but we are prevailing and are finally starting to bring hope to what seems like the most hopeless place on earth. Not only is it an incredible story, but because we are working with a videographer in Kabul who is filming the entire process, the whole world can watch this groundbreaking adventure unfold via video reports on our website. Currently, there are four reports posted at www.warkidsrelief.org/bridges/follow. Now…in order to get traction on this project, we need more people to watch the videos. So, starting TODAY, May 17, for exactly one week a very generous donor will give $1 for every video view…up to $10,000, for 10,000 visits!! This is money that we will use to expand our project to include a vocational training program for camp women so that they too can become more empowered and better care for their children. The challenge is only from today Monday, May 17 until Sunday, May 23 so we need to get the word out right away! If you have any questions, please contact me and I will help in any way I can. Thank you so much for helping spread the word. Together we can do this!!! !